“As an accounting major at UP, I have become interested in working for a multinational company like Intel. My responsibilities in the global accounts payable department include reclaiming escheated property owned by Intel, documenting a sustainable process, and analyzing the root causes to stop funds from going unclaimed. So far, I have learned about the systems and processes used by accounts payable and how all the different groups in corporate finance work together. 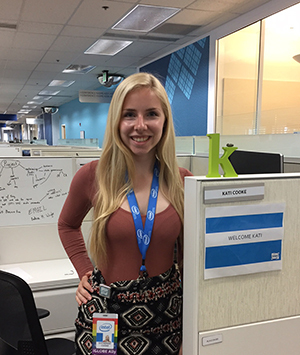 Intel has a great internship program with activities that allow me to meet other interns and employees. I’ve enjoyed meeting fellow interns from all over the country and having great experiences, such as attending a finance conference in California. Thanks to my resources at UP, including my accounting professors and the Career Center, I was able to secure my dream internship. Internships are important because it teaches students how to apply theories learned in the classroom to real life business decisions. Students need to have experience with business acumen and networking, which can all be learned and practiced through an internship.